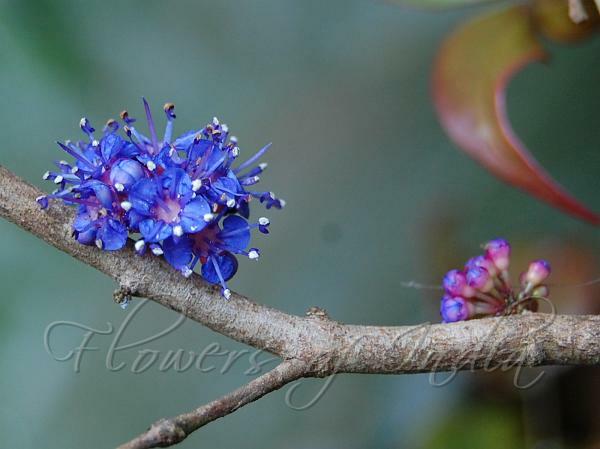 Stalkless Memecylon is a shrub with slender branchlets, bearing blue many-flowered cymes 1 cm across. Flower-cluster-stalks are short or absent; flower-stalks 2.5 mm long, slender; bracts fulvous-woolly. Flowers are 2.5 mm across; calyx shortly 4-toothed, puberulus outside; petals 1.5 x 1.5 mm, ovate, pointed, blue. Stamen filaments are 2.5 mm long, anthers curved; style 3.5 mm long. Leaves are 4.5 x 2.5 cm, ovate, bluntly tapering, stalkless or shortly stalked, greenish when dry; nerves 9 pairs. 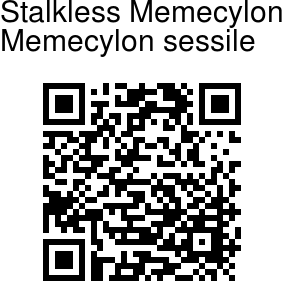 Stalkless Memecylon is endemic to Southern Western Ghats. Flowering: March-May.